1. Preheat the oven to 180˚C, gas mark 4. 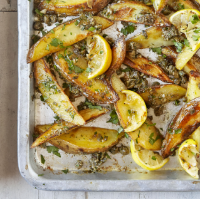 On a large baking sheet, toss the potato and lemon wedges with the oil and season. Spread out in a single layer and roast for 1 hour, until browned and almost tender. 2. Meanwhile, put the anchovies, capers, garlic and butter in a small saucepan. Add ½ the parsley and warm through until the butter has melted. 3. Spoon or brush the flavoured butter over the hot potatoes, then return them to the oven for a further 10–20 minutes, until golden and crisp. Scatter with the remaining parsley and serve hot, squeezing over the baked lemon wedges, if liked. This recipe was first published in Thu Aug 30 16:41:18 BST 2018.